Nine months ago Diebold’s Nick Laskovski made his way to our Westminster HQ to learn about Safety Entrances®. So far this year, Nick leads all of Diebold in sales of our Safety Entrances®. Diebold has about 16,000 employees. Sounds like Rookie of Year accolades are in order. We understand the folks at Diebold may be surprised by Nick’s “out of the blocks” success, but not us. We know a little something about outlier like Nick, because we’ve been labeled with the moniker a few times. They’re a myth. Nick earned his success through action. He took the initiative and invested his time to learn our product. He then listened to his client’s needs, their concerns and then delivered on his promises. A tried & true formula for sustainable success. Nick’s successes aren’t magic. He makes things happen through well planned action. We view Nick as an example of positive axioms such as luck favoring the prepared, or the smarter you work the luckier you get. We can all learn from sales professionals like Nick. That’s why we’re touting his success. Heck of a job by someone we didn’t know a year ago. This is a photo of Nicks latest order going through Factory Acceptance Testing. His client required two Synergy Touchscreen operator consoles for their two lane Safety Entrance®, which allows command & control from multiple points. You can see them wired up on the right. Nick’s Safety Entrance® will be shipped out after it’s approved for deployment. 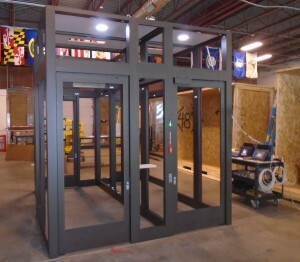 This entry was posted in ANSI & ADAAG Products, Anti-Terrorism, Banks & Credit Unions, Commercial Facilities, Uncategorized and tagged Access Control Portals, Access Control Vestibules, Anti-terrorism Technologies, Bullet Resistant Entrances, Interlocking Doors, Qualified Anti-terrorism Technologies, Security Vestibules. Bookmark the permalink.